The involvement of locals in development projects is quite appropriate in normal circumstances, as most international aid agencies now recognise. But this politically correct approach to development practice is simply inappropriate in the interpretation of the Anlong Veng sites. Why should interpretation take into account local perspectives if locals believe that Ta Mok and Pol Pot were good men? Do former Khmer Rouge have the right to have their understanding of history seriously considered in interpreting the Cambodian past? How are the perspectives of former Khmer Rouge to be weighed against the perspectives of other Cambodians who suffered because of rhe actions not only of rhe Khmer Rouge leaders, but also of Anlong Veng locals who followed those leaders? In the end we are forced to contemplate the questions that we raised early in this chapter: Why do we want to preserve such sites? To prevent forgetting? To aid In reconciliation. 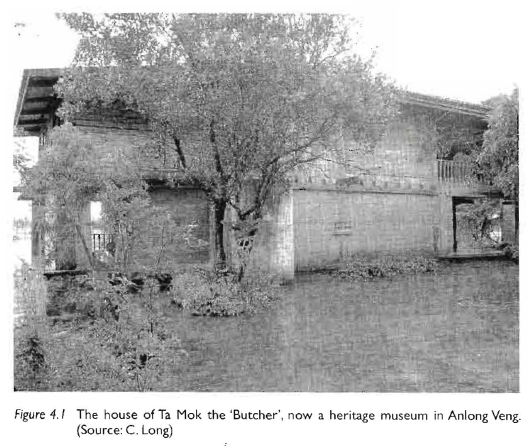 Can sites like Anlong Veng perform the latter role? In traumatized societies whar is most important justice or reconciliation? If the latter, does the preservation of sites of trauma help in achieving reconciliation? Does the preservation of these former Khmer Rouge sites help in the understanding and commemoration of Cambodia’s traumatic history? Our conclusion, which does nor come easily to us as heritage professionals committed to our field and to the power of herirage as a force for remembrance, is that preservation of the Anlong Veng sites does little or nothing to further understandIng or commemoration of Cambodia’s tragic and painful past. To wipe them from the heritage and tourism map would not be to encourage a culture of forgettIng. Tuol Sleng and other such sites, together with the everyday reality of Cambodian trauma and, hopefully, the trials of the remaining leaders, ensure that the Khmer Rouge period will not be forgotten. Forgetting Anlong Veng’s Khmer Rouge sites, though, will contribute to a culture of true reconciliation by ensurIng that the message about the Khmer Rouge period is clear and untrammeled by moral and historical relativism , by emphasizing above all else the voices of the victims and silencing the perpetrators once and for all.